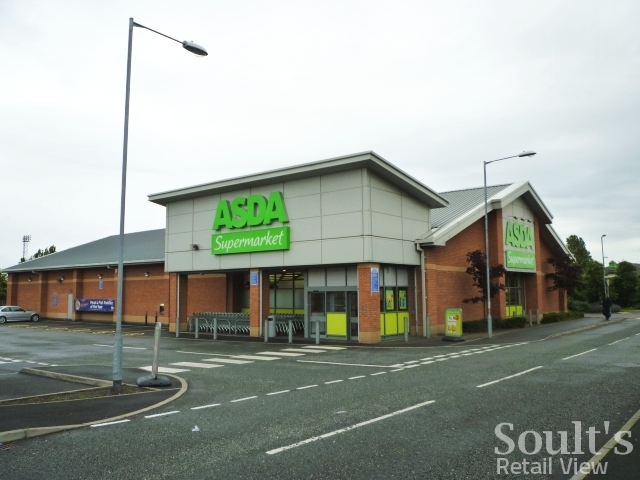 While some communities on Tyneside – among them North Shields and Wallsend – still have to wait a little longer for their Netto stores to be turned into Asdas, the process of converting 147 ex-Netto sites into Asda Supermarkets is continuing apace. Stores in Westerhope, Lemington and Gateshead are among those that have been transformed in the last couple of months. Following on from my ‘undercover’ visits to ex-Netto UGO stores on Teesside and an ex-Netto Morrisons in Tamworth – all among the 47 stores that Asda had to divest for competition reasons – Asda invited me, and my camera, to check out one of the stores that it’s kept and converted over to its own fascia: the shop at Old Fold Road, a mile or so from the centre of Gateshead, which serves the recently built St James’ Village housing development as well as more established, working-class communities in the Felling and Sunderland Road areas of the town. The focus of this first blog post is the store’s transformation from Netto to Asda, looking mainly at the revamped shop’s layout, ranges, and look and feel. 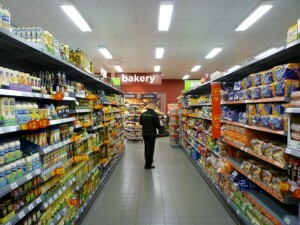 As well as letting me look around, Asda also challenged me to carry out a full weekly shop in the store and to test the much publicised Asda Price Guarantee: the company’s pledge to be “10% cheaper on your comparable grocery shopping” compared to Tesco, Morrisons, Sainsbury’s or Waitrose. 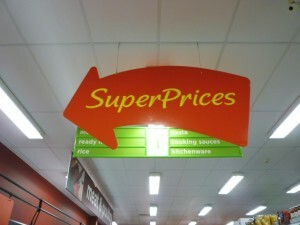 I’ll blog about my shopping trip – and reveal whether it was indeed cheaper – in a second post to follow soon. So, what is the store like? Externally, as you might expect, it’s little changed – just like the ex-Netto Morrisons and UGO stores that I visited before. 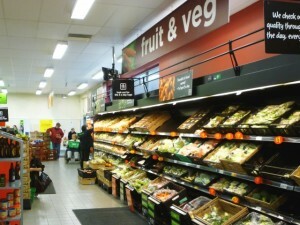 In this case, the Netto signage has been replaced by the new ‘Asda Supermarket’ brand – signalling the store as a smaller-than-usual Asda – while the bright yellow window vinyls have been replaced by similar ones in pale yellowy-green. 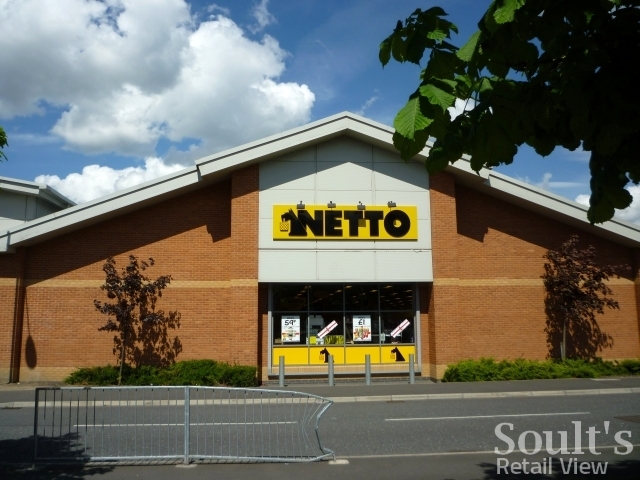 The store also retains the slightly unwieldy separate entrance and exit lobbies that were so beloved of Netto stores, and that got me similarly confused in Eston. 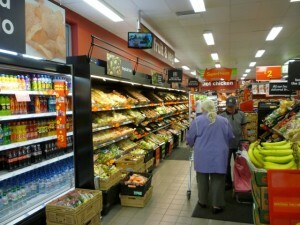 However, once you enter the store the extent of the interior transformation becomes clear. The entire shop was gutted and refitted in the impressively short two-and-a-half weeks betwen Netto closing and Asda opening, and it does now feel like an entirely new store. 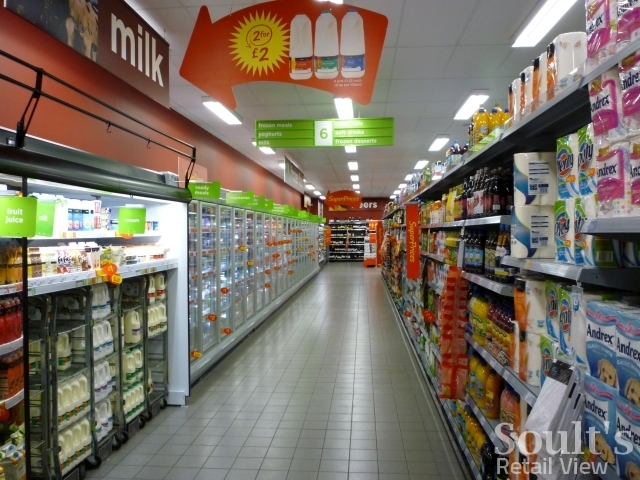 Configuring the space to accommodate the sheer increase in SKUs – from Netto’s 1,800 product lines to around 10,000 now – would always have made the shop look different. 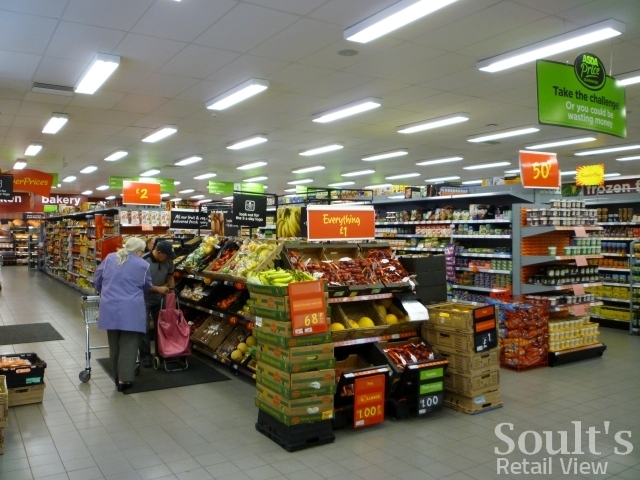 However, Asda’s investment in new shelving, floors, ceilings and wall finishes replaces the slightly dowdy Netto shopfit with a feel that is bright, clean and modern. Though the deep red walls bring to mind the latest Wilkinson storefit, they (and the matching signage) do work well in bringing some warmth and colour to what could otherwise have felt like a crisp but slightly sterile interior. 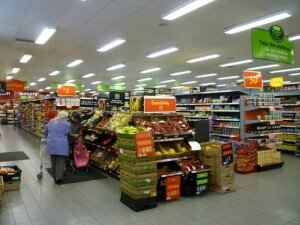 Inside the store, the logical layout of the entrance area is evidently designed to assist shoppers who are just popping in for one or two items. Newspapers and bestselling magazines are on the left as you go in, followed by a ‘Food to Go’ section featuring sandwiches, drinks and snacks. On the right are flowers, four self-service checkouts, three regular checkouts, and the kiosk beyond. 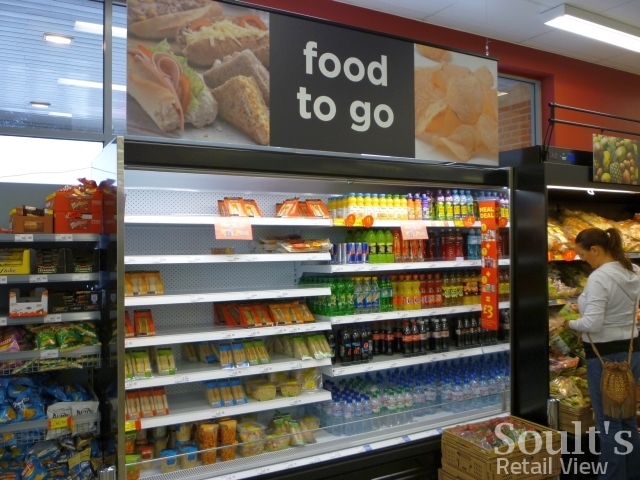 Given the store’s compact size, the kiosk has to perform multiple functions, serving as the customer service desk as well as housing the usual cigarette display and National Lottery terminals. 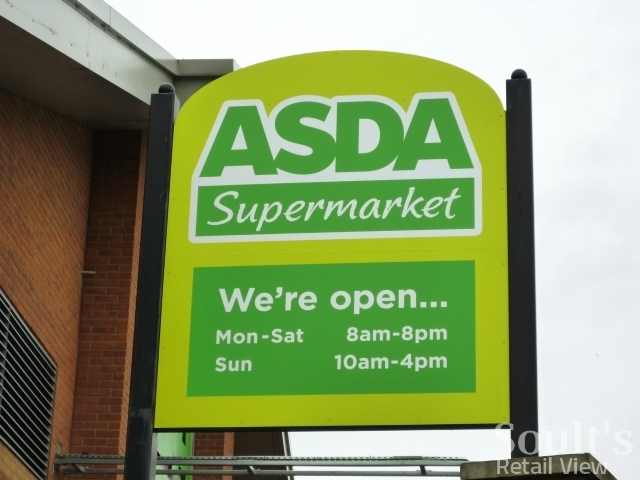 Crucially, it’s also the ‘Click and Collect’ point – a key part of Asda’s strategy to push its non-food offer and build multichannel traffic. 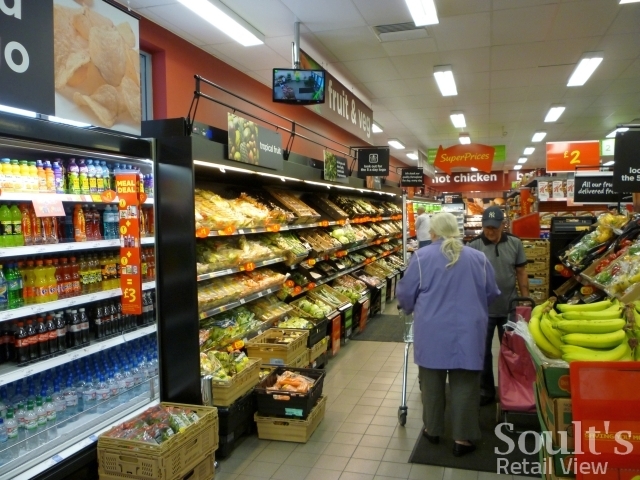 Less logically, spirits are also located at the kiosk – presumably for security as much as convenience purchasing – though their absence from the main wine and beer aisle does make it awkward to buy spirits as part of a full shop. 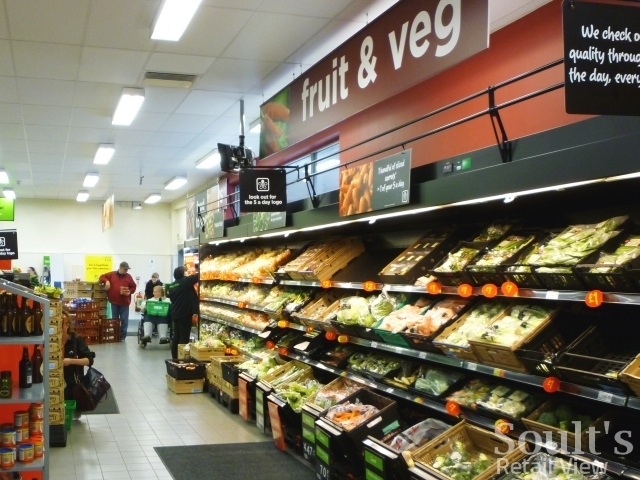 Entering the main body of the shop, customers are faced with what seems to be a relatively compact fruit and veg section relative to the ex-Netto UGO and Morrisons stores that I visited. 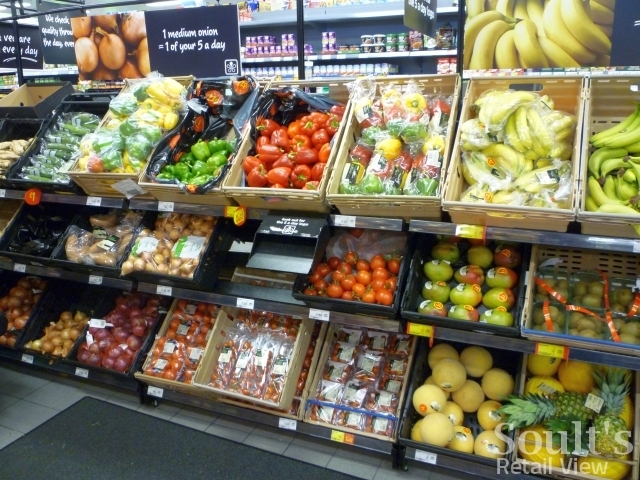 However, the multi-tiered shelving units allow a deceptively wide range of fruit and veg products to be fitted into the space, as well as helping to create a colourful and eyecatching display. 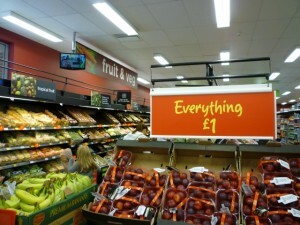 In fruit and veg, as throughout the store, value messages are key – Asda, for obvious reasons, is clearly keen to reassure former Netto customers that the prices on everyday items haven’t suddenly gone up. 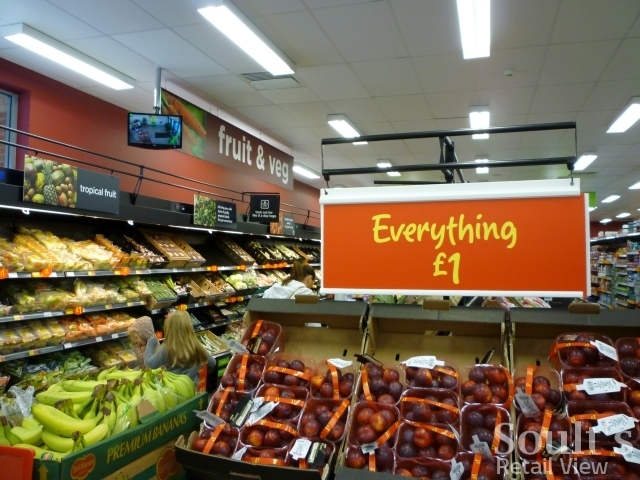 Perhaps trying to tap into the current success of single-price retailers like Poundland, banners and shelf-edge labels highlight items costing £1, while hanging arrow signs draw attention to specific offers or ‘SuperPrices’ more generally. 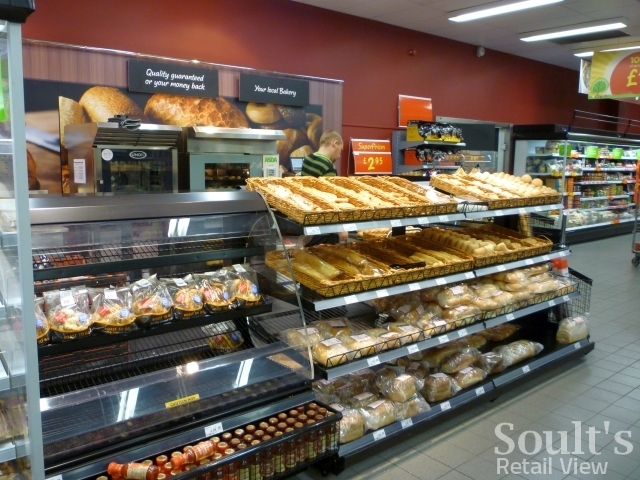 Apart from fruit and veg, the store’s other major focus of both fresh products and visual theatre is the instore bakery, with an adjacent hot chicken counter. 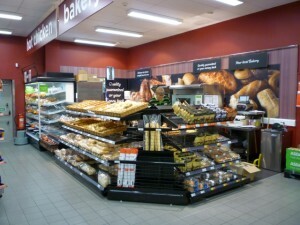 Wisely, the bakery is placed in a traditional back-corner location rather than near the entrance as it is in Tamworth’s ex-Netto Morrisons, ensuring that there’s plenty of room both to circulate and to admire the attractive display. On the downside, the store does lack a meat and fish counter, like the one Morrisons has squeezed into the old Netto in Tamworth; for me personally, as a fresh fish fan, that would limit how often I’d use this particular store for my full weekly shop. To be fair, however, I’m not necessarily the core demographic that this particular shop is catering for, and I’m sure Asda has done its homework in tailoring the store’s offer towards the everyday needs of local shoppers. 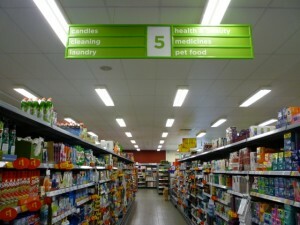 The heart of the store is its aisles of ambient products, and it’s here – in categories such as oils and bread – that the increase in both branded and own-label SKUs is really noticable. The upcoming blog post about my Asda shop will talk in more detail about how far I was able to get all the items on my shopping list. Generally speaking, though, it’s hard not to be impressed by how much Asda has squeezed into the space, including quite a few categories that never used to be represented in Netto. 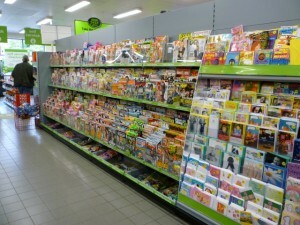 I spotted, for example, a pretty extensive display of magazines – complementing the newspapers and bestselling magazine titles by the door – as well as a decent range of reasonably priced greetings cards. 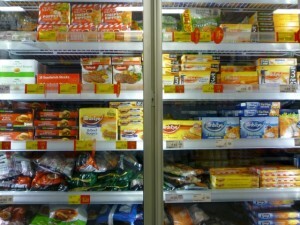 The overall extent of the non-food range is also surprisingly broad given the store’s limited space. 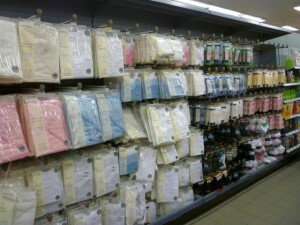 It includes stationery, babywear and underwear, as well as books and entertainment, though the latter two did have quite a lot of gaps at the time of my Monday morning visit. 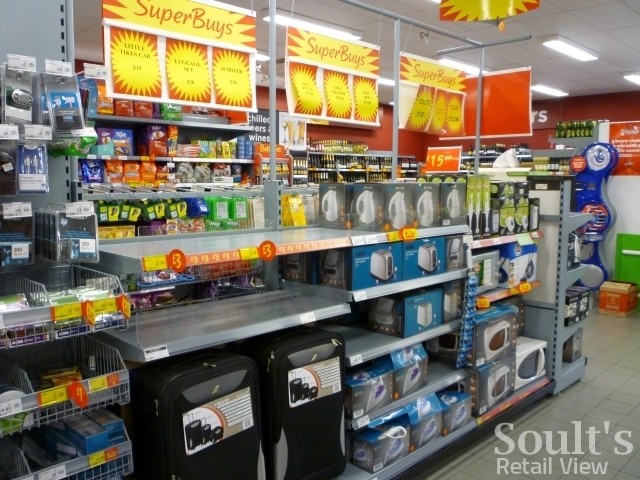 I was also interested to spot a display of non-food ‘SuperBuys’, featuring an eclectic range of luggage sets, scooters and toasters. 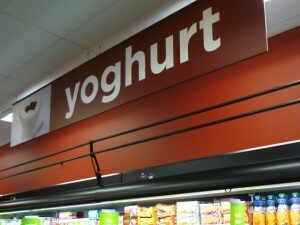 The deals – and the deliberately ‘home-made’ look of the signage – are obviously a nod towards the store’s Netto heritage. 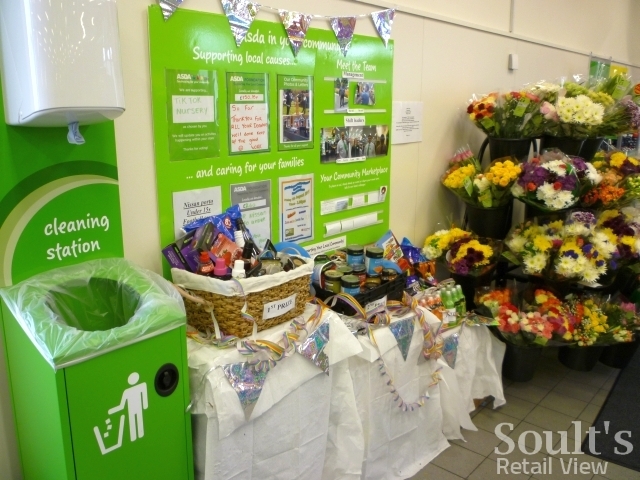 However, most of the featured items looked like the same Asda-branded products that you’d come across in a larger Asda store, meaning that the SuperBuys lacked some of the sheer randomness and element of fun that make the hard discounters’ non-food deals so popular. Nearing the end of my circuit, the store conforms to supermarket layout norms by locating the frozen foods and alcohol furthest from the entrance. 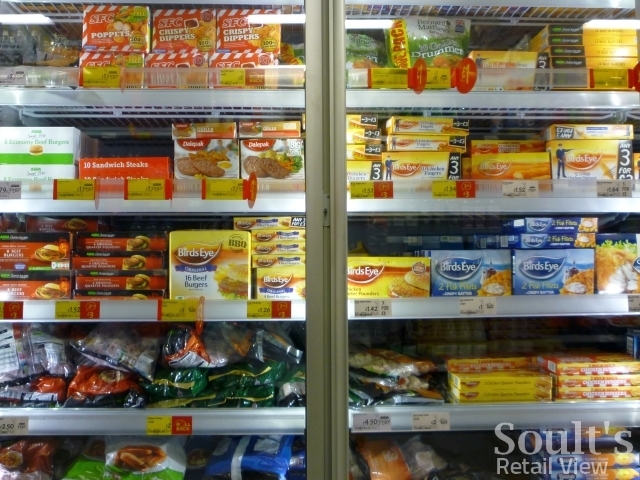 Unsurprisingly, the frozen section eschews Netto-style chest freezers in favour of upright ones – similar to those seen in Eldon Square’s Waitrose and other compact supermarkets – to ensure that the maximum number of products can be fitted within the space. 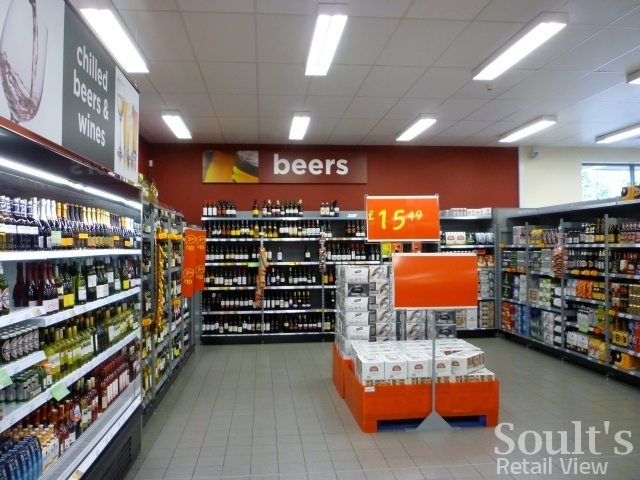 Though lacking the aforementioned spirits, the alcohol section is also impressive in its range, and compares favourably with the old Netto offer – including, I was pleased to see, a cabinet of chilled beers and wines. Selling drinks that people can consume straight away seems like an an obvious move, and more often than not the major grocers’ convenience stores do it. 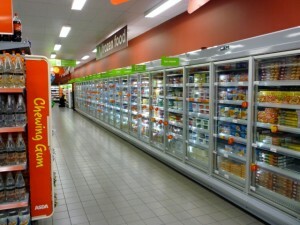 However, I’m always surprised at how many larger supermarkets don’t have a chilled drinks cabinet, including M&S – surely the ultimate impulse purchase grocer, and the place where you stock up on your way to dinner parties. To put things in context, it’s worth flagging up that I’m not usually an Asda shopper, partly because the store nearest to me – at Metrocentre – is overwhelmingly huge, full of children, and a nightmare to drive to. 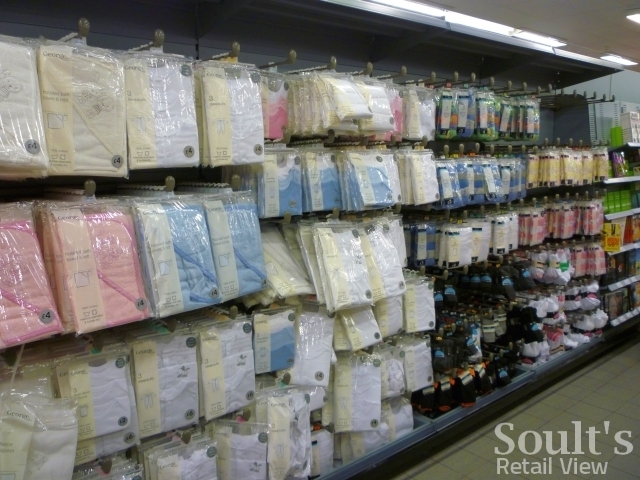 When I do shop there, it’s more often than not to check out the George clothing or other non-food ranges rather than to do a full shop – for which I prefer to go to Waitrose or Morrisons. 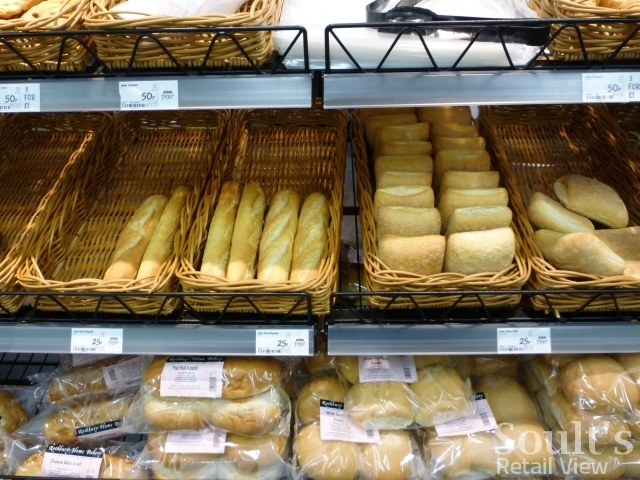 Asda might well be cheap – more of which in my next post, of course – but at the vast and busy Metrocentre store you do pay for it in increased stress levels. Having said all that, it’s hard not to be impressed with the new Asda Supermarket at Old Fold Road. The transformation from Netto is remarkable, and Asda’s investment in the store – and, by extension, the local community – is admirable. 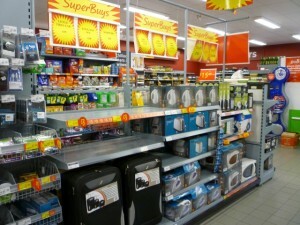 The attractive store environment, improved ranges and lovely staff – including ex-Netto colleagues supplemented with new recruits – are all big pluses, as is not having to walk around a huge store to find everything that you want. Living two-and-a-half miles away, it’s fair to say I probably wouldn’t go back to this particular store on a regular basis. However, if I lived in the area, I’d certainly have no qualms about using the store for either convenience purchases or the bulk of my weekly shop (though preferably on a weekday, when I took my photos, rather than the more hectic Saturday afternoon when I carried out my actual shop). Last week, Retail Week reported that Asda had seen sales uplifts of 50% in its converted Netto stores, and that there were now plans to open 250 more smaller Asda Supermarkets instead of the 100 that had been originally envisaged. It’s not hard to see why sales are buoyant, given the improvement in the shopping environment and offer; indeed, staff at Old Fold Road told me that while former Netto shoppers were still happily coming in, they were also seeing plenty of new people who had never set foot in the store while it was Netto. 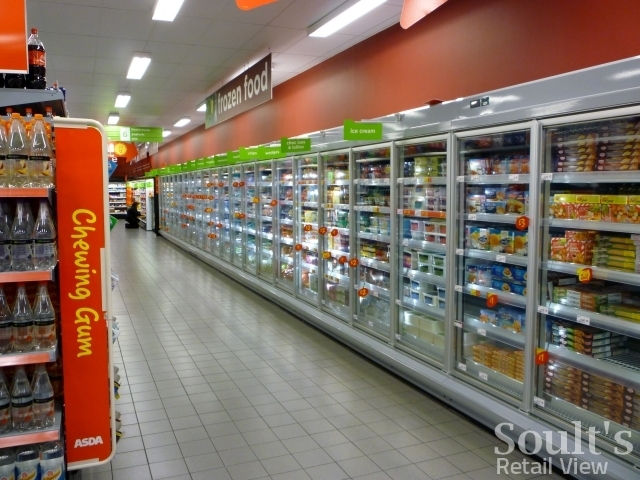 In recent history, big supermarket takeovers – be it Somerfield buying Kwik Save, Morrisons snapping up Safeway, or the Co-op buying Somerfield – have rarely gone to plan, typically resulting in disgruntled customers and haemorrhaging of combined market share. However, if Asda can maintain the early momentum across its converted estate – keeping existing Netto shoppers happy while simultaneously attracting new customers from its rivals – this might finally be a retail takeover that delivers on its promise. Well I for one am rather pee’d off at the Asda conversions, like I have mentioned here many times. We’ve now go two within walking distance of each other in Gosforth, you can literally walk between them in 10 minutes. 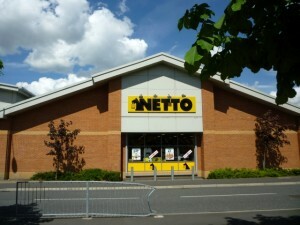 Our purpose built Netto was an asset to the North Gosforth, Red House Farm and Wansbeck Road communities. Everyday items like vegetables, pepsi, washing powder, bleach, frozen foods were always at least 10-15% cheaper than Asda and their special offers were unbeatable. 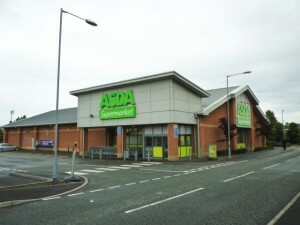 It closed on Saturday and now we’re going to have another Asda. Everyone I talk to rolls their eyes at it. A small Morrisons or an Aldi would have been the preferred choice so we’d actually have some choice in this suburb. There’s now an Asda in Westerhope, Cramlington, Benton, Gosforth, Gosforth Wansbeck Road. All within a 5 mile radius of my home. Not exactly competitive is it ? 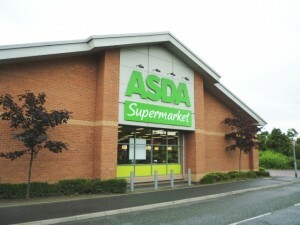 Hopefully the Gosforth Wansbeck Road store under achieves being so close to the 24 hour Asda and we get something else. Nice visit Graham, I think their conversion work has been widely seen as a good thing but the 50% uplift talk isn’t a ‘true’ picture as such considering Netto lost interest in the stores as Dansk looked to leave the UK and the stores were always a bit down market. The true test will be the viability of the model when they expand further, they’ve targetted 250 but they also did the same with Asda Living but that remains stagnant with store count well below their internal targets. Also like for like sales when Asda have been in control for a year will also be interesting, can they develop the model further? 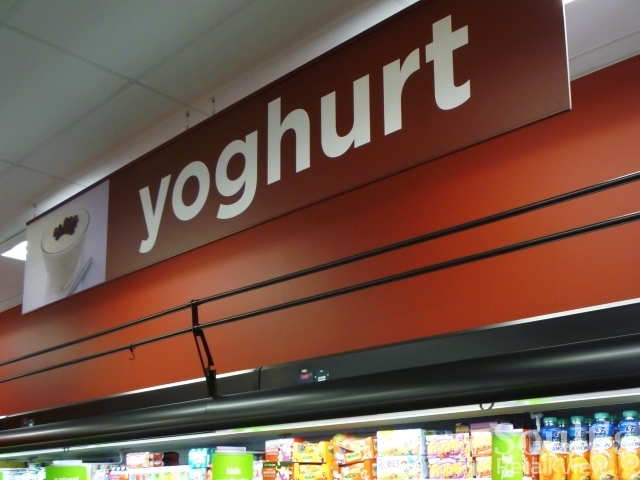 It seems their frequent achilles heel – availability is a continual challenge in the supermarkets as a few of your pictures show huge gaps on the shelves. As a pledge says in the warehouses of some main stores ‘stock it and they will come’. I think by moving the self-service entrance elsewhere and repositioning the lottery/cigarette counter to the beer corner (a rather large waste of floorspace for a relatively small amount of goods – see the picture above!) 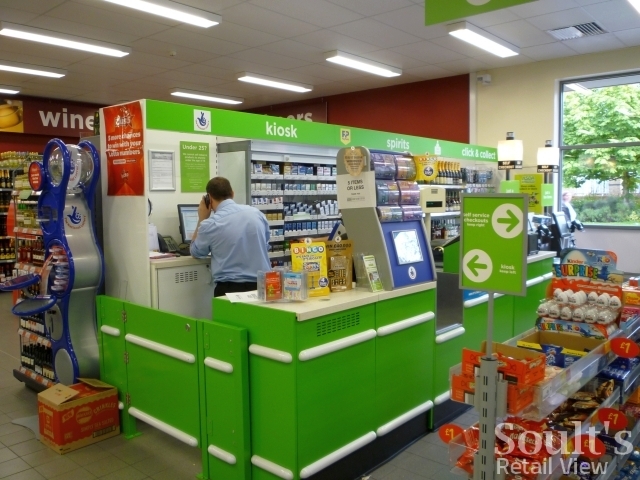 would not only make accessing cigarettes and lottery more convenient when doing the rest of your shop, but would also free up space for two more checkouts. Now that it’s open I’m not sure if there would be an opportunity to make any further changes, but those would be my improvements. I’ve popped in to the store twice I think mainly because it’s on the felling bypass and convenient when coming out of gateshead Stadium and the till issue is a major gripe. if they made the self checkout 10 items or less (or handbaskets only)they could clear the ques a lot quicker. But as it stands the staff are pulling people with full weekly shops out of the cue to show them how to use it! and it takes them twice as long as a standard till to get sorted. 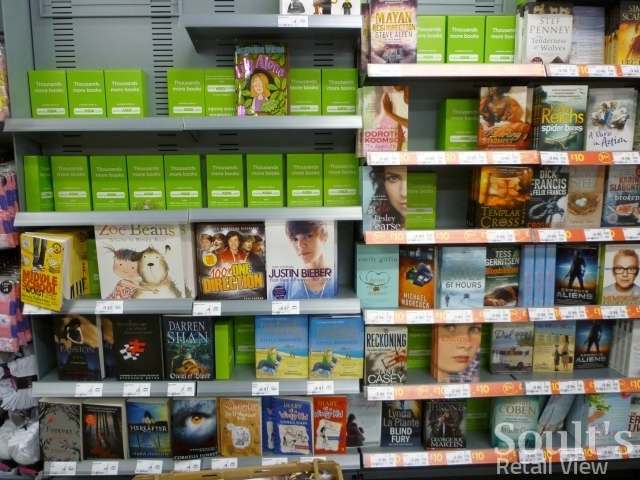 Could it be a case of ASDA underestimating how busy the stores were likely to be? They have been trading remarkably well. Difficult to know how they could solve the problem as well; the till area is already pretty imaginatively laid out. It’s a really great asset having it practically on my doorstep and the range is unbelievable when compared to the meagre offerings of its predecessor. Having said that, I haven’t done a weekly shop there despite it being literally 60 seconds from my door. It’s strange when I think about it, as on thinking about what I buy on a weekly basis they definitely stock everything I need. 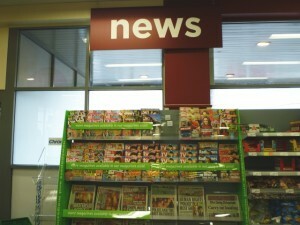 When it comes down to it, I think what puts me off doing my weekly shop there is the checkout area. 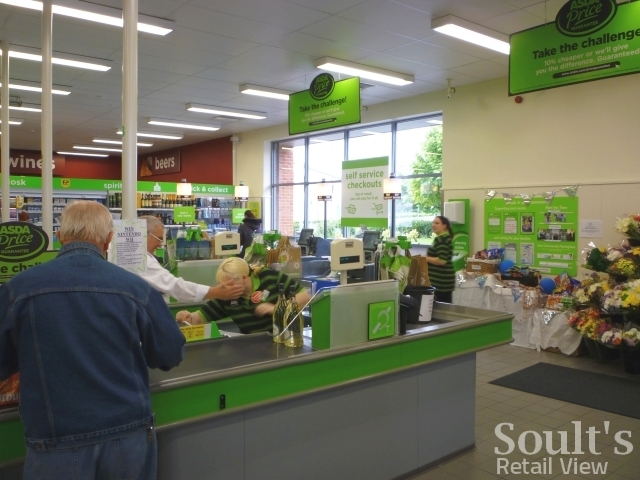 In busy periods it’s an absolute nightmare – the queues will trail far back into the store as the three checkouts struggle to cope with the sheer number of people and the self-checkout grinds to a halt as people with little experience of using the machines attempt to put an entire week’s worth of shopping through the scanners with little success. The most I’ve ever bought is around 10 items and anything more than this I wouldn’t even consider purely because I dread going to the checkout. It’s definitely something they need to address and I’ve noticed that since its opening the number of people visiting has rapidly declined and I wonder if the checkout experience plays a massive part in this. I was very pleasantly surprised to see the conversion take place so quickly. The stores are excellent little places in their own right; the space has been used very imaginatively. The entrance is a bit weird though; I feel they should look in to changing to a normal, wide, open door as most convenience stores have. But yeah, the whole thing is overwhelmingly positive.